Sarah Nader- snader@shawmedia.com Carolyn Moore (left) of Woodstock and Brushana Fulks of Woodstock look at all the different types of baby carriers while attending a Babywearing International of North Central Illinois meeting at Woodstock Assembly of God Tuesday, September 15, 2015. Members and guests learn about the different types of carriers, safety tips/the right way to wear and why women choose to baby wear. Members are able to check out carriers from the groups lending library each month. 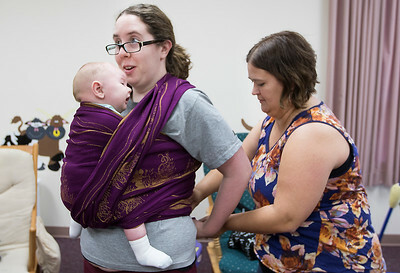 Sarah Nader- snader@shawmedia.com Danielle Schmider of Wonder Lake holds her newborn daughter, Camille, in a Ergobaby carrier while attending a Babywearing International of North Central Illinois meeting at Woodstock Assembly of God Tuesday, September 15, 2015. Members and guests learn about the different types of carriers, safety tips/the right way to wear and why women choose to baby wear. Members are able to check out carriers from the groups lending library each month. Sarah Nader- snader@shawmedia.com Tabitha Goins of Pingree Grove (left) teaches Mary Farley of Wonder Lake and her son, Deklan, 2 months, how to put on a woven wrap baby carrier while attending a Babywearing International of North Central Illinois meeting at Woodstock Assembly of God Tuesday, September 15, 2015. Members and guests learn about the different types of carriers, safety tips/the right way to wear and why women choose to baby wear. Members are able to check out carriers from the groups lending library each month. Sarah Nader- snader@shawmedia.com Mary Farley of Wonder Lake and her son, Deklan, 2 months, is taught by Tabitha Goins of Pingree Grove on how to put on a woven wrap baby carrier while attending a Babywearing International of North Central Illinois meeting at Woodstock Assembly of God Tuesday, September 15, 2015. Members and guests learn about the different types of carriers, safety tips/the right way to wear and why women choose to baby wear. Members are able to check out carriers from the groups lending library each month. 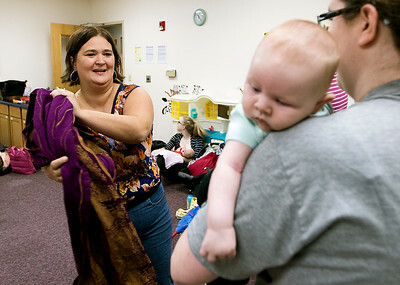 Mary Farley of Wonder Lake and her son, Deklan, 2 months, is taught by Tabitha Goins of Pingree Grove on how to put on a woven wrap baby carrier while attending a Babywearing International of North Central Illinois meeting at Woodstock Assembly of God Tuesday, September 15, 2015. Members and guests learn about the different types of carriers, safety tips/the right way to wear and why women choose to baby wear. Members are able to check out carriers from the groups lending library each month.